Saturday evening - me after having a long week and a hard and long and not easy Friday - decided to bake a cake. Not only my 5 minutes in the kitchen but my hour. There's a reason for my last cake before a pause I'll take for vacation: I am going with two of my friends for a bike ride to the Palace Philippsruhe in Hanau-Kesselstadt tomorrow. You don't know Castle Philippsruhe? Don't worry. Here's a link to the German Wikipedia article. Sorry, there's no English version, but check the photos. I've been there last week with an other friend and we had the luck to catch the "city party". It was funny and we drunk some beer. As always I had a headache after drinking beer - I am indeed a wine guy. After the tour which will be about 17 miles we're be for sure very hungry so I made something for a late lunch and later we have coffee and the apple pie. It was called Old Country Style Apple Pie, but I'll call it Apple Pie à la Andrea & Udo. Why? Because I got some CDs, from Andrea Berg and Udo Jürgens to cheer me up. You don't know Andrea? Here's the link to the English Wikpedia. Well, what can I say about Andrea - it's something like German pop but not Folk or Polka which I really hate. Just some hits in German which are sometimes very touchy. 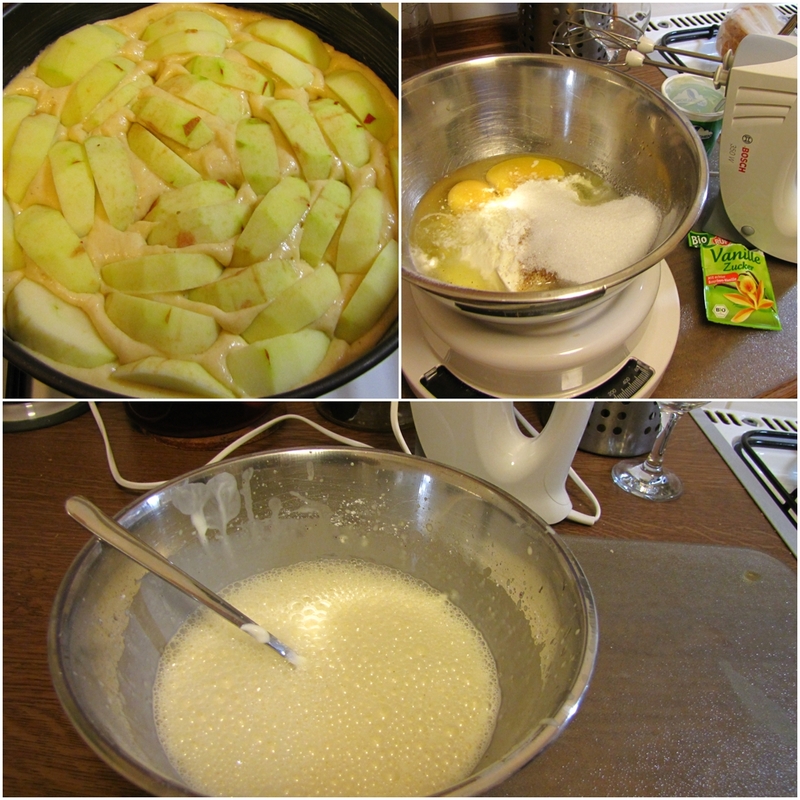 It was so peaceful doing something manual work (preparing the cake) and listening to the Schwerelos album from 2010. Sometimes sad sometimes positive. Just the way life is. The second CD I was listening was the latest one of Udo Jürgens. Come on, you're not going to tell me you don't know Udo Jürgens, one of the most popular singers in the DACHLi countries (German speaking World) and in my opinion one of the best singers in the DACHLi World. Here's the Wikipedia article. He has style and his music is so peaceful but sometimes more than touchy. Maybe it's why he's popular in ALL age groups. My granny loves him, my parents love him and I love him. 3 generations - yes, he has style and he's singing in a wonderful German. The album Der ganz normale Wahnsinn which is his newest one is really well done and the songs have class and style. 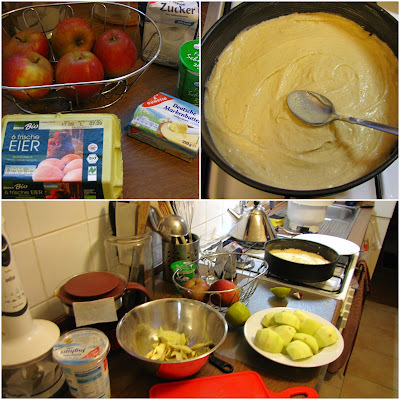 So that's why I called the cake, the Andrea & Udo Apple Pie. Mix the butter with sugar + salt + vanilla sugar until it becomes like cream. Add the eggs. Mix it for a while. Add the yogurt or cream. Add the flour you mixed with the baking powder. 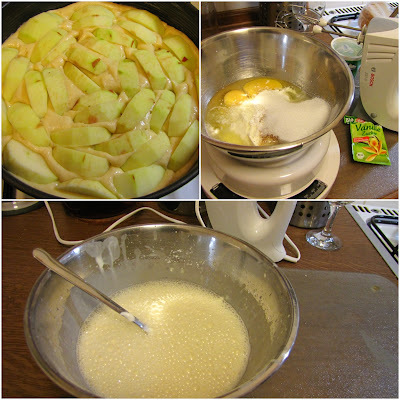 Mix it for a while until all ingredients become creamy. Put the dough to a 10 1/4" (26 cm) round baking pan. Peel the apples and cut them in 8 pieces every. Put it on the cake. Bake the cake for 12 minutes at 350°F (175°C) for 12-15 minutes. 1 package vanilla sauce OR some vanilla sugar/extract together with 2 tablespoons potato flour/farina instead (what I did). After those 12-15 minutes the cake was in the oven, take it out and put the topping from step two over the cake. Put it to the oven again and bake for ca. 50 minutes more. That's all. The picture you can see on the top of this post was taken after the cake was 10 seconds out of the oven. So it took me one hour to write this post. Enjoy the cake and have a great Sunday. So thanks again, dear Ch. for your splendid hospitality. I enjoyed the day with you, the same goes for S.
See you tomorrow evening - there will be a cooking revenge ;) Hope you'll enjoy it.